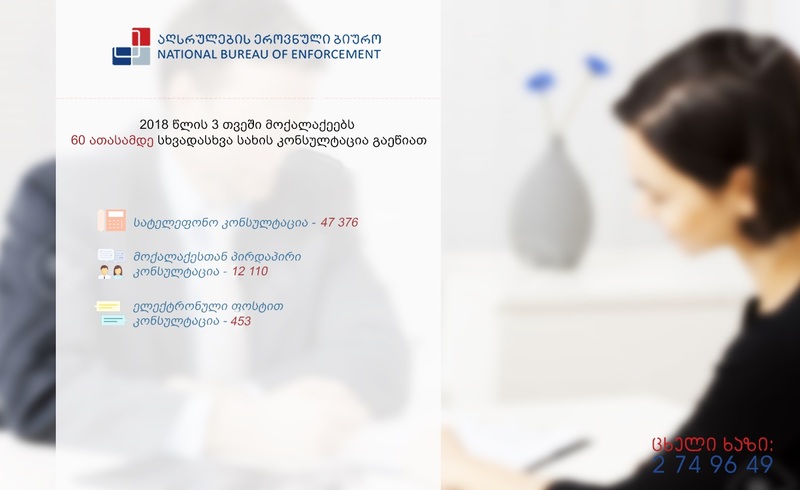 The national execution bureau during 3 months of 2018 publishes the statistics of the consultation was conducted towards the citizens. There came and get consultation telephone call of 47 376 citizens, which is more than several thousand units in comparison to previous year. With email there were consulted 453 questions of the citizens. The national execution bureau is ready to conduct the legal consultation to any party of the execution proceedings, to protect their interests and rights. Interested citizens can address the bureau office or call on hot line (032) 2 749 649, or write on email info@nbe.gov.ge or write on official Facebook page. The policy of national bureau, is completion of the litigations with settlement.